WASHINGTON, DC – Brett Kavanaugh became the 114th justice to serve on the U.S. Supreme Court on Saturday, when the Senate confirmed him by a vote of 50-48, handing President Trump and Republicans a historic victory that shifts the balance of power on the Court. The vote came in the middle of the afternoon on Saturday, less than 30 hours after the Senate invoked cloture late Friday morning to end an attempted filibuster by Senate Democrats and one Republican, Sen. Lisa Murkowski (R-AK). Senators invoked cloture by a vote of of 51-49, thanks to the “nuclear option” first engineered by Democrats under former Sen. Harry Reid (D-NV) in 2013, lowering the threshold from 60 to 51 for presidential nominations. Sen. Steve Daines (R-MT) was in his home state during the final vote, walking his daughter down the aisle at her wedding. Daines was willing to take a private jet immediately back to Washington if necessary to cast the deciding vote, but Murkowski – the only Republican to oppose Kavanaugh – agreed to vote “Present” instead of “No” on the final vote, to neutralize the effect of Daines’ absence and keep the two-vote margin for Kavanaugh’s confirmation. President Trump sees appointing conservative Supreme Court justices as one of the reasons he was elected. Polling showed that in the 2016 election, 48 percent of voters said the Supreme Court was a major factor in their presidential vote, and 21 percent of voters said it was their top issue. Those voters chose Trump over Hillary Clinton by a margin of 57 to 41. Saturday’s confirmation marks more than the dramatic conclusion to a political battle that has waged for more than three months, and instead could mark an inflection point in a philosophical war that has raged for decades. A conservative majority on the Court has been considered within striking distance since 1993, when two moderate justices were the swing votes on almost every issue that divided along philosophical lines. In 2006, conservative Justice Samuel Alito replaced one of those moderates, Justice Sandra Day O’Connor. Since then, the Supreme Court has long been divided with four conservative justices to one degree or another, and four liberal justices on the other. The crucial fifth vote was the sole remaining moderate, Justice Anthony Kennedy. When Kennedy announced on June 27 that he would retire during the summer, both political parties – and especially their respective bases – leapt into action with the most expensive, most brutal Supreme Court confirmation in American history. Both sides understood that issues of overwhelming importance both to conservatives and to liberals could be at stake. Talking heads quickly zoned in on Trump’s “List” of 25 potential justices. A week later, President Trump had narrowed it to four finalists: Judges Thomas Hardiman, Amy Barrett, Raymond Kethledge, and Brett Kavanaugh. The political Left went into immediate meltdown, with raucous protests outside the U.S. Supreme Court. Alternate protest posters left on the ground included the names of the other three finalists as well, showing that liberals would have had a fit for any nominee President Trump might choose. Experts from both sides dived deeply into Kavanaugh’s lengthy paper trail. He has authored an impressive 307 published opinions during his 12 years on the bench, totaling over 6,000 pages of judicial writing. When combined with the opinions he joined written by his colleagues, senators had over 11,000 pages of judicial decisions to examine in assessing Kavanaugh’s fitness for the High Court. Beyond that, Kavanaugh submitted over 112 pages of answers to questions from senators, and included 17,000 pages of attachments. When combined with the records released from his public service over the past quarter-century, senators were flooded with a staggering 483,000 pages of material to review on Kavanaugh – more than the past five Supreme Court nominees combined – setting an all-time record. Kavanaugh’s hearings before the Senate Judiciary Committee during the first week of September were heavy-hitting and constantly interrupted by protests, but he weathered the storm and appeared to be on a glide path to confirmation. All that changed during the second half of September, when accusers brought forth sordid and salacious accusations of a sexual nature, which had never come up during Kavanaugh’s long service or the six FBI background investigations throughout his career. A final curveball came in the form of Sen. Jeff Flake (R-AZ), who said he would require a final FBI background check into these allegations before voting for the judge on the Senate floor. Sens. Mitch McConnell (R-KY) and Chuck Grassley (R-IA) acquiesced, in light of their razor-thin margin in the Senate. The FBI came back saying that they found no corroboration for the accusations. Flake and several other moderate senators then announced their support for Kavanaugh, including Sen. Susan Collins (R-ME) who gave an impassioned speech about the presumption of innocence and due process. Collins’ speech highlighted how toxic judicial confirmation fights have been over the past couple years, deepening the divides in the nation. Experts worry that many of the most qualified candidates for high office – and especially the Supreme Court – will not answer the call to serve since it means lasting trauma for their families and reputations. Regardless of all that, at age 53 Justice Kavanaugh now takes his seat as the newest associate justice on the Supreme Court, and is expected to serve for decades. Major cases already pending before the Court could reveal very quickly whether he is what conservatives have been waiting for these many years. Justice Kavanaugh will begin hearing cases on Tuesday, October 9. Newspapers were the primary and sole source of news for 150 years after the nation’s founding. In 1926, the first national radio network was established, known as NBC, or the National Broadcasting Company. By 1934, two additional networks had begun airing news and entertainment to an ever growing national audience. Thus, the citizenry began to increasingly rely on the news as aired on radio. In 1925, less than 19% of all homes had a radio; by 1941, that number had increased to 75%. This growth prompted the passage of the Communications Act of 1934, which created the Federal Communications Commission (FCC), thus placing de facto control of the electronic media under the federal government and greatly limiting competition. Three networks essentially had a national monopoly on the dissemination of news broadcast over the airwaves in the 1930s and ’40s. It was then when the issue of fair and balanced reporting began to be bandied about and the so-called journalists in the broadcast media found it necessary to initiate the mantra that their “profession” was the epitome of credibility and integrity. All the while, nearly all, together with their cohorts in the print media, were unabashedly and stealthily promoting Franklin Roosevelt and the bulk of his big-government policies – marking the beginning of the cozy relationship between the media and the Democratic Party that exists to this day. Many television reporters and anchors assumed celebrity status, as they were in the homes of Americans on a daily basis. As such, their credibility was rarely if ever questioned. The term “mainstream media” began to be used by the television networks and their allies in the print media to further enhance their image of impartiality and believability. While there were a few news anchors and reporters who tried to be impartial, the majority were not. Walter Cronkite was portrayed and feted as “The Most Trusted Man in America.” Yet he almost single-handedly, along with his cadre of reporters, convinced the populace that a significant victory by the American Army in Vietnam, the Tet Offensive, was an overwhelming defeat and embarrassment, thus denigrating the valor of the soldiers and turning public opinion against them. Across the spectrum, his reporting, abetted by what stories the network chose not to cover, skewed significantly toward the Democrats and liberalism. This approach to presenting the news was essentially the same on all three networks and replicated by their collaborators in the print media. In their anger and retaliation, far too many mainstream reporters, editors, anchors, and columnists exhibit an inability to generate an original thought or comprehend basic concepts, hence fabrications, innuendo, and “fake news” are the hallmark of the mainstream media today. Further, they are much more impatient than those who preceded them – thus, the herd mentality in the despicable reporting on Judge Kavanaugh, the distorted coverage of Donald Trump, and the determination to foment tribalism and resentment. PROSECUTOR’S SENATE REPORT OUTLINES 9 REASONS WHY CHRISTINE BLASEY FORD NOT CREDIBLE. POMPEO TO MEET WITH KIM JONG UN ON SUNDAY, STATE DEPARTMENT ANNOUNCES. Secretary of State Mike Pompeo will meet with North Korean leader Kim Jong Un in Pyongyang on Sunday as part of his trip to Asia beginning later this week, the State Department announced Tuesday. Pompeo also will visit Japan, South Korea and China as part of his trip, State Department spokeswoman Heather Nauert announced. It will be Pompeo’s fourth visit to North Korea. Pompeo is expected to attempt to set up a second summit between Kim and President Trump, who previously met face-to-face in Singapore this past June and issued a vague statement pledging to remove nuclear weapons from the Korean Peninsula. Since then, negotiations over when and how denuclearization would occur have been rocky, with with neither side able to agree on a starting point and widespread skepticism in the United States over whether Pyongyang is serious about renouncing an arsenal it sees as the only way to guarantee its safety. Hopes for progress in the talks got a boost last month when South Korean President Moon Jae In met with Kim in Pyongyang for their third summit. The summit resulted in a joint statement in which North Korea expressed willingness for a “permanent” dismantling of its main nuclear facility in Nyongbyon — if the United States takes corresponding measures — and the dismantling of a missile engine test site and launch pad in northwestern North Korea. Earlier Tuesday, North Korea’s official propaganda ministry accused the U.S. of “trying to subdue” it through sanctions, indicating that the Kim regime could see lifting such sanctions as a key bargaining chip in any talks over the future of North Korea’s nuclear program. Pompeo has been a vocal advocate of maintaining maximum pressure and sanctions on North Korea until it has made clear and significant moves to denuclearize. In a speech at the United Nations last week, North Korea’s foreign minister claimed North Korea is ready to implement the agreements Trump and Kim made at the Singapore summit, but also accused Washington of failing to demonstrate its willingness to ease tensions and build mutual trust. JAMES O’KEEFE STRIKES AGAIN: OPEN COMMUNISTS IN GAO ADMITS TO SLOW-WALKING PRESIDENT’S AGENDA. James O’Keefe and Project Veritas released the third installment in their undercover video series unmasking the Washington DC Deep State. President Trump went on a furious tirade on Thursday as he slammed Congress’s “ridiculous” spending bill, deriding the lack of money for his campaign-promised southern border wall. “’We can’t secure the Border because of the Democrats historic level of Obstruction. The Presidents fed up with this. His agenda is working. The economy is growing at twice the rate it did under Obama. We’ve nominated and confirmed 68 Federal Judges, 26 Court of Appeals Judges…'” he wrote on Twitter. “If we don’t get border security after many, many years of talk within the United States, I would have no problem doing a shutdown,” Trump said. “We’re the laughingstock of the world. … We have the worst immigration laws anywhere in the world,” he added. Claims hit their lowest level in nearly 49 years and pointed to robust labor market conditions. Initial claims for state unemployment benefits slipped 1,000 to a seasonally adjusted 204,000 for the week ended Sept. 8, the lowest level since December 1969, the Labor Department said on Thursday. Jobless claims fell, despite ongoing trade tensions. Left-wing groups that disrupted the confirmation hearings for Judge Brett Kavanaugh have admitted that they were funded by George Soros and other major Democratic donors, according to an exclusive report from The Daily Caller. 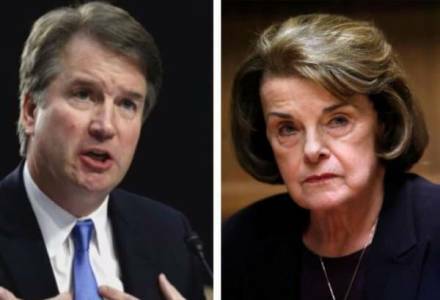 The Daily Caller got wind of a conference call conducted by representatives from the three groups on Monday night, and used the dial-in code for the call to listen to the entire conversation, where the participants discussed two anti-Kavanaugh protests; one scheduled for Thursday at a confirmation hearing for lower-court nominees, and another next Monday. CPD national field organizer Darius Gordon reportedly stated that protesters required a government-issued ID and “your cash for the post-and-forfeit.” Gordon and Housing Works national advocacy coordinator Paul Davis allegedly added that if protesters didn’t have their own money, the left-wing organizations would supply funding for the projected post-and-forfeits to protesters who didn’t show up with their own money. Davis apparently asserted, “If you do not have access to your cash we will certainly be able to arrange to get it to you before the action,” adding that such a procedure had been implemented at previous anti-Kavanaugh protests. Ethics Officer Fails to Recognize Breach on Ethics Form: “somebody just rubber stamps it and it goes forward…”UPDATE: 3:48 PM | Project Veritas attorney Benjamin Barr filed a complaint with the Department of State regarding the findings of our video. See the complaint here. Socialist Activism at the State Department Mr. Karaffa’s loyalties seem to be with DSA, not with his employer. VIOLENCE AGAINST RIGHT ESCALATES AS MEDIA AMP UP HATE-RHETORIC AGAINST TRUMP. Incidents of violence and threats against the political right have escalated as the establishment media amp up its hate rhetoric against President Trump and his supporters. The morning after Meet the Press moderator Chuck Todd compared media critics to racist segregationists and singled out Fox News as one of America’s biggest problems, a man in a “mentally agitated state,” and apparently upset over an officer involved shooting, intentionally crashed his vehicle into the studios of FOX 4 in Dallas, Texas. Besides Todd, many in the media, especially at far-left CNN have “othered” Fox News and presented the network as a unique danger to America. CNN’s Brian Stelter has gone so far as to spread conspiracy theories about Fox News controlling President Trump. Hours after the far-left Washington Post published Joe Scarborough’s September 11 op-ed claiming Trump is a bigger danger to America than the 9/11 terrorists, a mass shooting threat was made against a group of Trump supporters meeting at the president’s hotel in Washington DC. Overall in the media, most especially at CNN, a coordinated narrative based on nothing but palace intrigue and gossip has been deployed to smear Trump as mentally unstable, reckless, and in need of removal from office — via the 25th Amendment, if necessary. Although no one is alleging any kind of wrongdoing on the president’s part, and while Trump’s domestic and foreign policy have put the country in the best shape it has been in in nearly 20 years, the media are using Bob Woodward’s anonymously sourced book and an anonymous New York Times op-ed to scare and divide American into believing an objectively successful president is a madman. To hype his latest book, Fear: Trump in the White House, Woodward said on the Today Show this week that Trump “jeopardizes” our economy and national security. Woodward, however, did not and was not asked to explain how this could be true when the country is doing so well. CNN constantly attacks Trump with hate rhetoric, smearing him as “delusional,” as not mentally or psychologically “fit” to be president. Like Woodward and the Times op-ed, this is all being fed to the media anonymously. But over the past week or so, as the economic news has gotten better and the Russia Collusion Hoax has collapsed, the desperate hate-rhetoric from the media has escalated. These attacks have also extended to the Republican House for “not doing anything” to save our country from the madman Trump. Disgraced Watergate journalist Carl Bernstein stated on CNN that he believes our country needs to be “saved” from Trump. What kind of dogwhistle is he sending with rhetoric like that? While most voters roll their eyes at the melodrama, the real world effects of this inflammatory rhetoric are strikingly real. Breitbart News has already tallied over documented 550 instances of harassment, threats, and outright violence aimed at Trump and his supporters, and now were are seeing a definite uptick this week as the media have amped up their ad hominem attacks. When you compare Trump supporters to segregationists, claim Trump is worse than the 9/11 terrorists, and tell the world we have a madman for president, of course you are calling for drastic action against both him and his supporters, and that includes assassination. BENGHAZI SURVIVOR REFUSES TO STAND DOWN AS OBAMA ATTACKS BENGHAZI ‘WILD CONSPIRACY’ THEORISTS. ​Obama accused the GOP of meddling in conspiracy theories while giving a much-anticipated political speech at the University of Illinois Friday. TRUMP’S ACTIONS REDUCE IRAN’S BOASTING TO BEGGING EUROPE FOR HELP. Iran, reduced to begging after the Trump administration walked away from the disastrous nuclear deal in May, issued a warning to European nations that if they don’t play ball by November 4, Iran will opt out of the nuclear deal itself. On November 4, the U.S. is scheduled to impose sanctions on Iran’s vital oil industry. U.S. sanctions on Iran have already included banning Iran from buying dollars and trading gold and other precious metals, as well as targeting the automotive sector. The European Union, desperate to appease Iran, had sworn to protect the nuclear deal, but their efforts to circumvent American sanctions have proven difficult to achieve. The New World Order and their global subjugation plan, feeds itself on the ignorance of the masses, there are millions of people countering that Marxist subjugation, and one of those organization has spent millions of dollars and time to investigate and develop a very explicit video of what the plot is all about, it’s tactics and their plan. If you are not one of those millions of people who prefer not to be an ignorant, I recommend you see this long Video. I would like to make some explanations that will facilitate your better understanding of this video: Hitler in Germany was the first fascist government that used the millionaires in his fascist Government effectively. Since then, but much more active in the last 50 years, an elite of bankers are dominating the world to carry out the new world order. In all these years they have learned that only with a fascist/Marxist dictatorship will they be able to do it. With their help, doctrine, and with the great power that the money has given them, allowed them to take control of following key points - education, food production, healthcare, energy, the media and the military force-- to carry it out. If you haven't heard of the plan, that doesn’t mean that hasn’t existed for over fifty years. What that means is that they have manipulated the media and your education to keep you unaware of what is really happening.